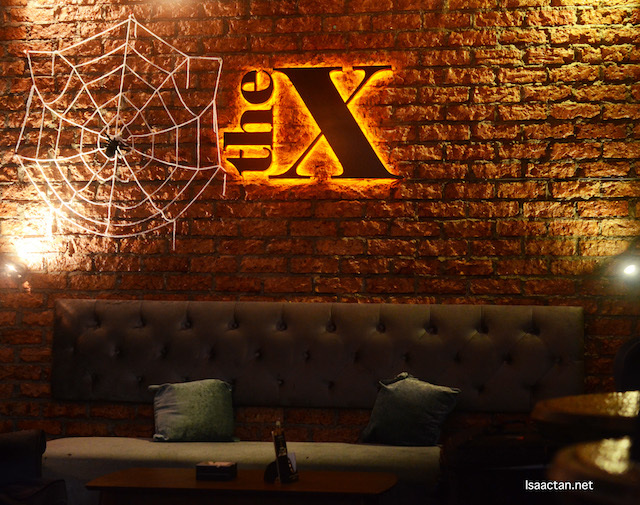 Short and simple, that pretty much sums up the name of this cool eatery, The X Bangsar. I was there a couple of times, and they have never failed to impress me with their noms. Serving western cuisine and great cocktails, from what I saw, it's a pretty popular spot to chill after working hours. Check out below on what we had that evening. 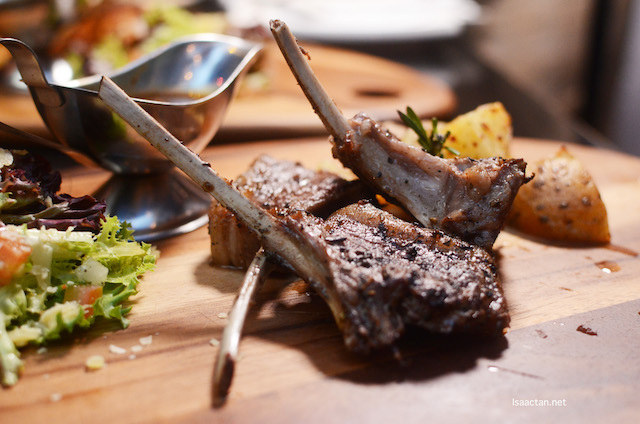 If you noticed the first picture in this blog post, that's my favourite dish over at The X Bangsar that night. 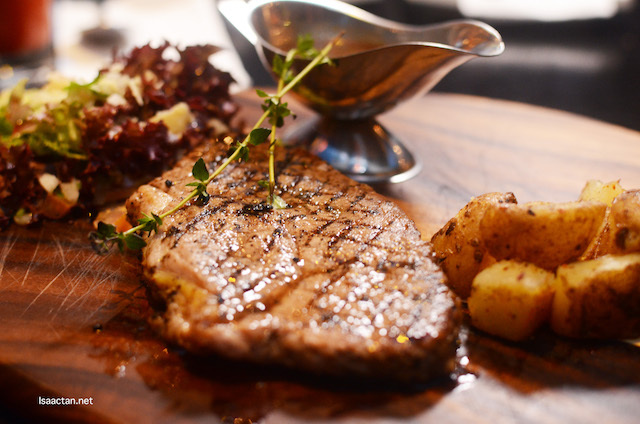 Sirloin steak, yes please! We had a really nice slab of 180gms Australian sirloin steak that evening, one which I could easily finish off by myself. The steak came on a beautiful platter filled with roasted potatoes, and mixed salad on the side. I like my steak as it is, but you can pour on some of the black pepper sauce if you like. Push It, what an interesting name. When you're dining at The X, remember to try their cocktails as well. We tried some, one of it named Push It which is a combination of Lagavulin 16y.o. 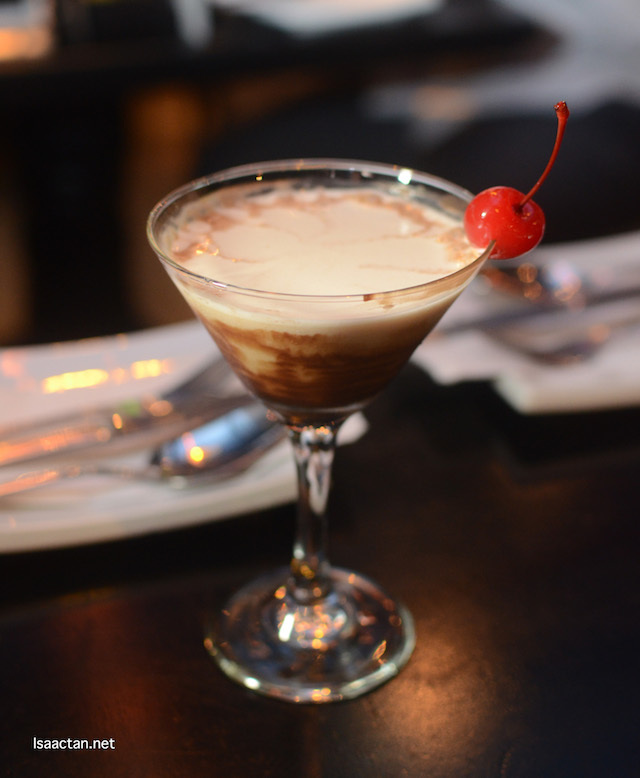 Bailey’s, Amarula, Milk, and SHOTT chocolate. A good mix indeed, I'm all set to have some good food! 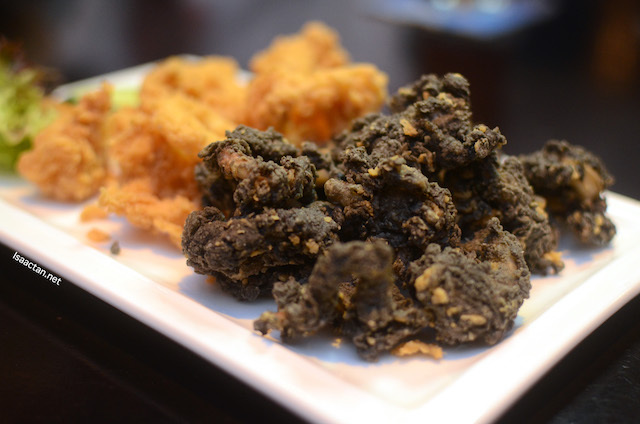 The perfect bar food and snack, you must try out their Deep Fried Calamari, served 2 ways, in squid ink and another in tempura style with wasabi mayo. Unique, I equally liked both of it, with a preference for the squid ink one. I've tried squid ink rice, but never in this form. Good stuff, next one is even better! 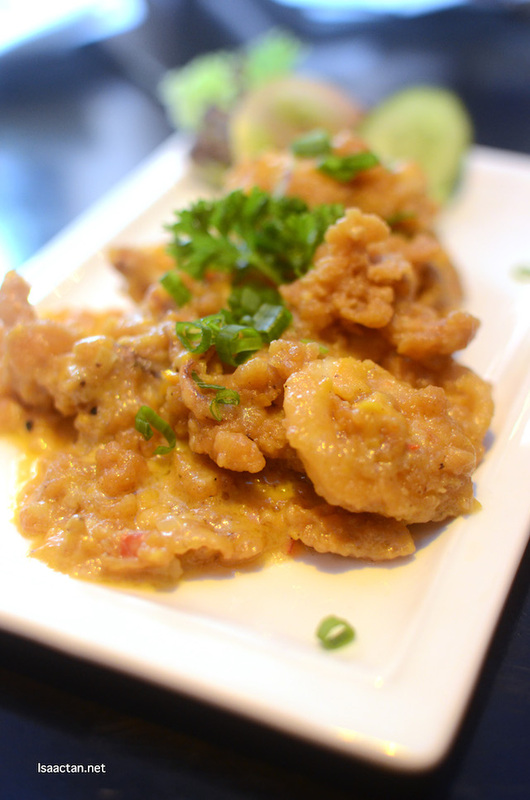 For that exotic salted egg flavour, do try out their Salted Egg Calamari. Almost akin to a Chinese cuisine, as you can see from the picture above, each calamari ring is coated with generous amounts of salted egg yolk gravy. Pretty nice, albeit may be a tad unhealthy if taken in large amounts. 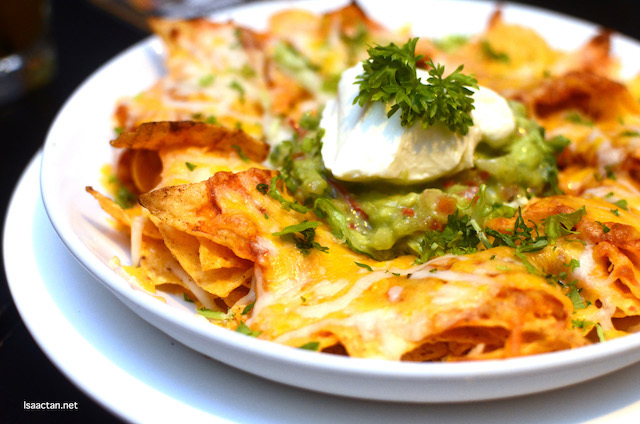 The X Bangsar's Nachos with Guacamole comes in a rather large serving, good to feed up to 3 or more friends who are looking to munch on some snack while downing their beers. The snack is fully loaded with lots of cheese sauce, sour cream, and jalapeno. Good for sharing, the Ocean Delight Pizza is one of The X's signature pizza. 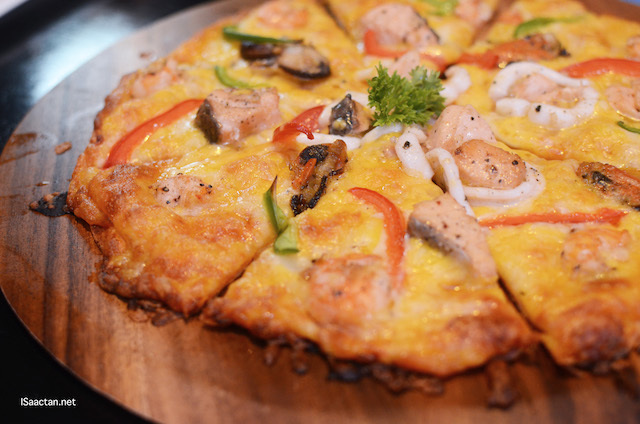 Topped with ingredients ranging from calamaris, shrimps, mussels, salmon, capsicums and mozzarella cheese, I love the fact the pizza is really thin and yummy! Sliders are good to have on your own, or to share with friends. 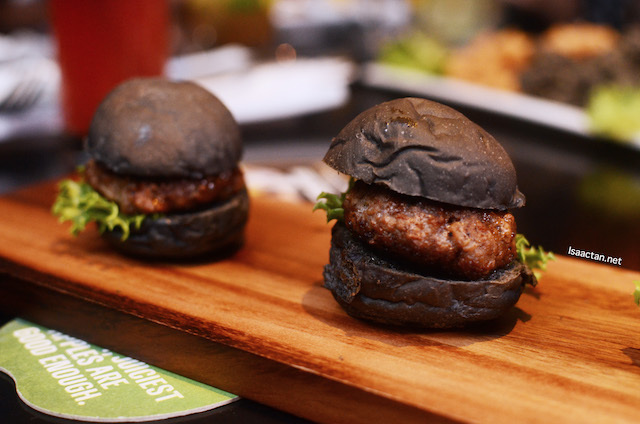 These mini burger sliders all come served in Japanese Bamboo Charcoal Buns, in either a choice of beef or lamb patties. Juicy and delicious, I could not get enough of these meaty delight. Beautiful cuts of New Zealand lamb racks, I love it the moment it arrived. Cooked medium rare, the lamb cutlets are cooked just the way I like. Tasty, not too tough, and very flavourful! Apart from my steak, these would be my 2nd favourite dish that nice at The X Bangsar. Special thanks to Racheal from Foodilifecious for the invite to savour these wonderful fares. Suka tengok u snap the pictures. Nanti ajar i okey...the restaurant look comfortable & cozy. The squid ink in tempura style ni macam sedap tetapi belum pernah makan yang squid ink ni..
OMG is indeed weird to see if Isaac's blog is all beautiful pictures and food looks good to me. Wow this Jalan Telawi, Bangsar looks amazing eatery. The foods are tempting and I want to try all, especially their Ocean Delight Pizza. Awesome! I am impressed with the food presentation of The X. Not so much a meat eater myself but still, tempted to gobble them up! Getting into my list of restaurants to try when in KL! The steak looks really good! If been there, I will also list that to my favorite food too =) Nice ambiance of this place! Wahh. The restaurant name, The X itself sounds so exclusive and expensive. And they even portray it to the food presentation. I love the name with "X". Nachos with Guacamole look so delicious! Omg... The food looks scrumptious and delicious! Would definitely check out this venue!